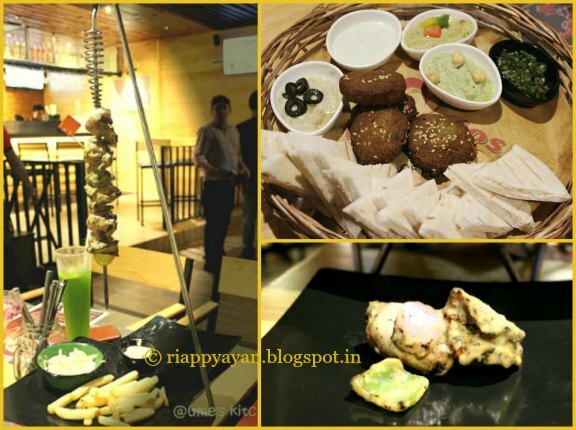 Quite new in Kolkata's food scenario, Portuguese and Middle eastern Cuisine has come in the name of "Barcelos", a newly opened Food Chain who are famous for their flame grilled food from Portugal, house of Peri Peri. Located at the top most floor of Acropolis mall in Kasba, it's very easy to locate. 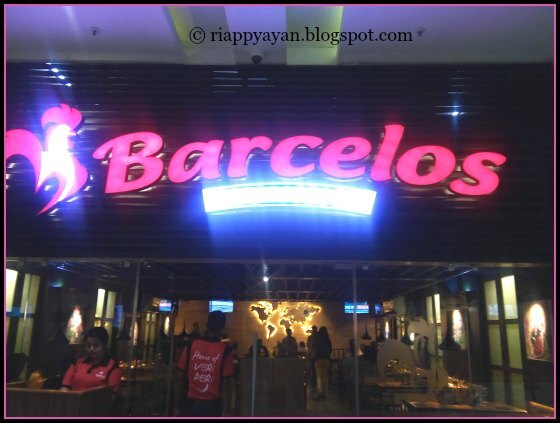 Barcelos opened its first store in Pretoria, South Africa back in 1993. 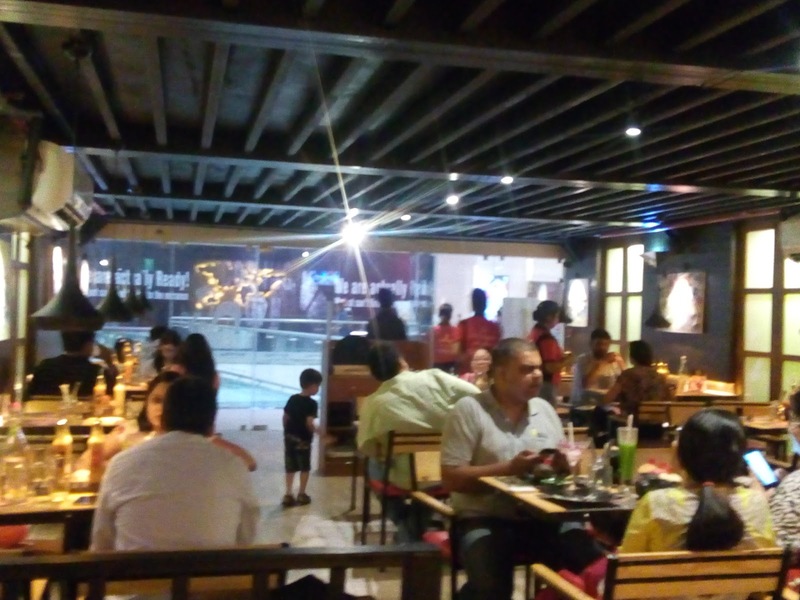 Using recipes mastered by the Portuguese hundreds of years ago, the flame grilled flavours became so popular that Barcelos can be found now in Worldwide and India is their newest destination. In India, Kolkata is their second outlet just after Delhi. 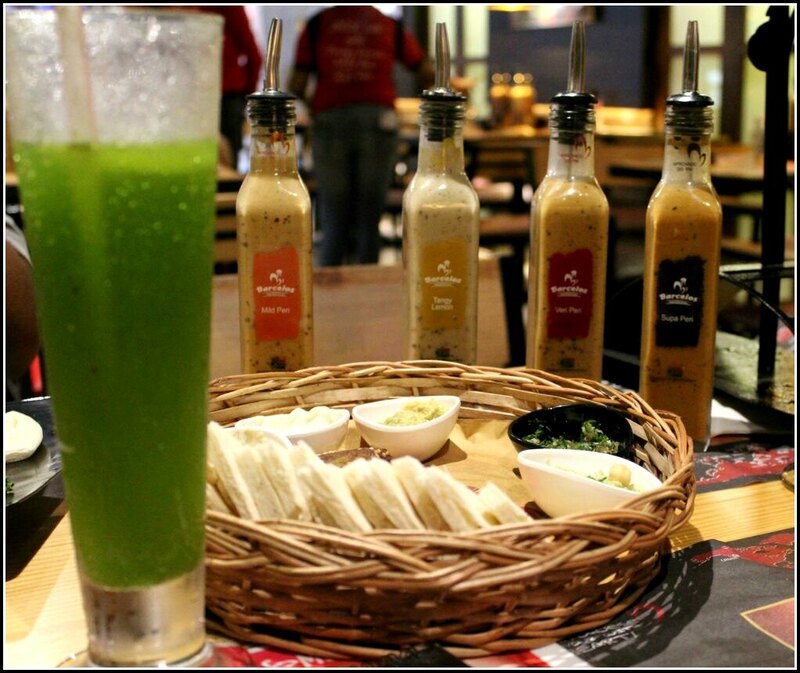 Barcelos has kept their name after a quaint Portuguese town, Barcelos which is very famous for their Peri Peri Sauce. Peri Peri, a chilli, a small member of the Capsicum genus. There is a interesting story behind the town of Barcelos. According to the 17th century legend, " a pilgrim seeking food and water in Barcelos, was accused of stealing from a landowner. The pilgrim was sentenced to hang despite his protests of innocence. In a last minute appeal to the judge, who was enjoying a roasted rooster for dinner at the time, the pilgrim boldly stated, “If I am innocent, then that rooster will get up and crow!” Suddenly, a gorgeous scarlet-plumed cockerel rose from the plate, crowing loudly. The man was acquitted of course!" Today the town’s shops and streets are decorated with colourful ceramic roosters, and it is still a place to have a leisurely and hearty meal or a slow cup of coffee. When we, Kolkata Food Bloggers, got invited for a bloggers review meet at Barcelos, I had a faint idea of the famous peri peri sauce and Portuguese Cuisine but honestly speaking, I've never tasted them before. So I got excited and went there with lot of excitement with three of my other food blogger friends from Kolkata Food Bloggers. 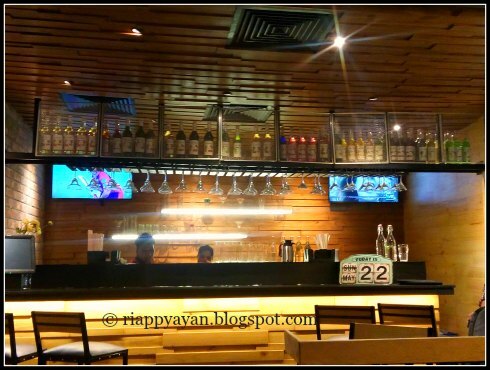 After reaching any restaurant, my eyes always revolves around the interior of the place. 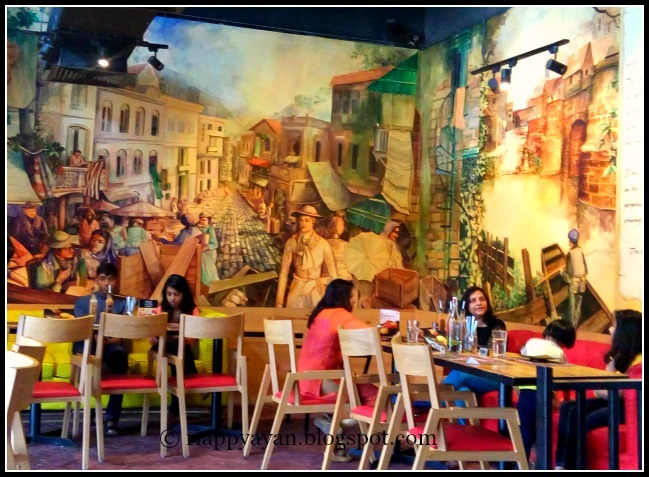 This time too, I went on to check the interior of Barcelos and got pleased with their Modern wooden decor with two full-walled painting of the city of Barcelos and their social life. In one wall, they have the world map showing the countries and cities, Barcelos is opened highlighted with yellow light. 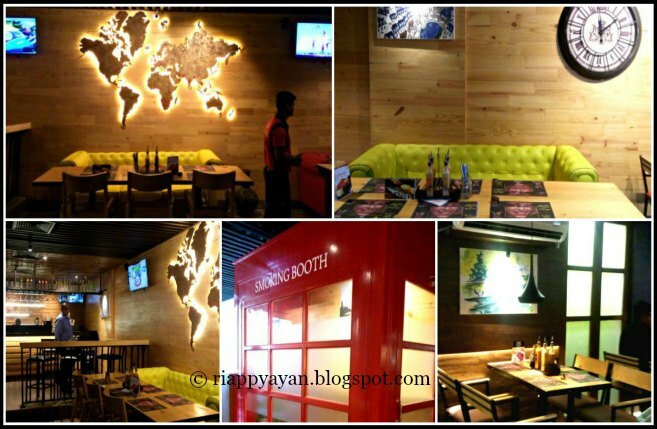 And in one corner, they kept a red colored closed booth for smokers which is very similar to London Phone booths. So the ambiance and seating couches are quite comfy for a relaxed family eat-out or friends hangout and this is obviously going to be a plus-point for Barcelos. (directly imported from South Africa) served at the table. Three types of Peri Peri sauces are named according to their spice level are - Mild Peri, Very Peri and Supa Peri where Supa Peri is the spiciest and a Tangy lemon sauce beside the Peri Peri sauces. At first, we four were served the four glasses of mocktails or as they call it their "Molecular drinks" - First one was "Kiwi Cooler" served in a tall glass which is basically Kiwi puree twisted with spices and sprite/soda added. The second one was "Hey Rosey" served in a short round glass made up of rose syrup mixed with cardamom and topped with rose petals and sprite/soda. And the Third one was "Tangy Mango" served also in a tall glass where tangy mango puree seasoned with spices and Sprite/soda added. As all these were molecular drinks, servers very eagerly were pouring liquid nitrogen us after serving on the table, which was giving the drinks a smokey effect. I tried the Tangy Mango one and it was a bit too tangy according to my taste but overall not so bad and quite refreshing. 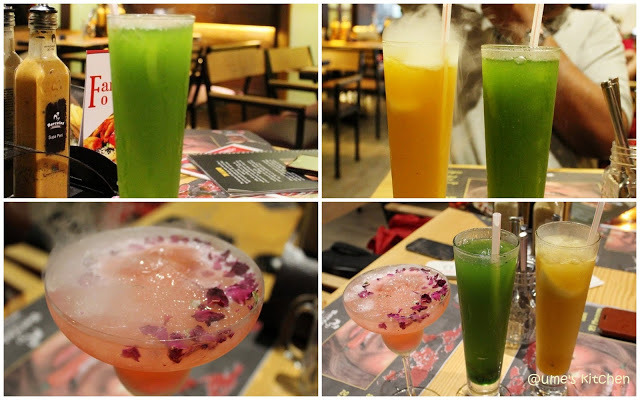 Other than few more mocktails, they have quite a few cocktails or drinks with alcohol too for alcohol lovers. After drinks were served, it was time for appetizer and the servers brought a big basket full of goodies which they call "Arabic Maze Platter" which consists of Hummus, Baba Ganoush, Peri Hummus,Yogurt Dip, Tabouli, Falafel, Lavash with 3 Pitas. The platter is sufficient for 2-3 people if you are not hungry like lion. Along with it, came the non-vegetarian starter, which is by the way their one of Portuguese signature dish, Chicken Espetada, is basically flame grilled bite-sized chicken breasts, onion and bell peppers skewed on a hanging long skewers which is served on your table and you have to pull out from the skewers to serve yourself with some crispy french fries and lettuce mayonnaisee dip. It will be a crowd-pleaser that I'm sure as the whole appetizer part has surely won my heart. After these yummy appetizer, they brought in some coloured burgers which I havn't seen or heard before. As a food blogger, I've heard a lot about different whole-grain burgers but never heard or seen any colored burger which has all natural color and no artificial color. A good innovation I would say in the Burger World. They also have some amazing number of wraps, Middle-eastern Pitas along with a huge variety of Burgers. The list of burgers are also not a few, some are regular burger, some are colored burgers made with whole wheat, what they call, "World's Healthiest Burger". 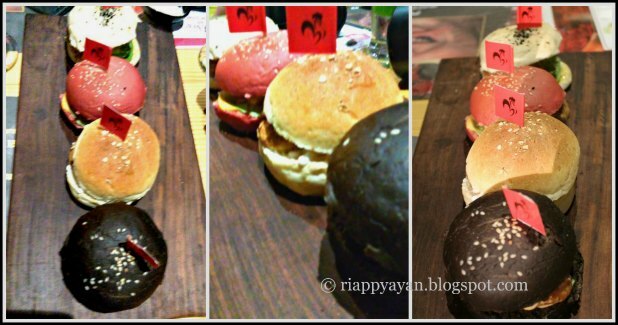 This colored burgers already made a buzz and a must-try main coarse item in Barcelos. The fact that made these burgers healthy is that they are made with all natural colors and wholemeal flour. The Red bun is made of tomato powder, chilli powder and wholemeal flour. The black bun is made of roasted wheat, spinach extract, herbs and wholemeal flour. The white buns are made of milk powder, coconut and plain flour. The buns tasted really healthy and tasty filled with veg and chicken patties along with peri peri sauce, pickled jalapenos, onions and cucumbers etc. We 4 were served 4 of these healthy burgers and we had to take one bite from each to taste all of them. 2 of them were veg and 2 of them were non-veg. Anyway, all of the burgers were juicy and soft but each of them tasted quite similar having peri peri sauce inside them. I personally don't like much sauces and mayonnaise in my burgers, but my friends found them quite appetizing and Its highly recommended. But I must say, those black, red and white buns were melt-in-the-mouth texture. 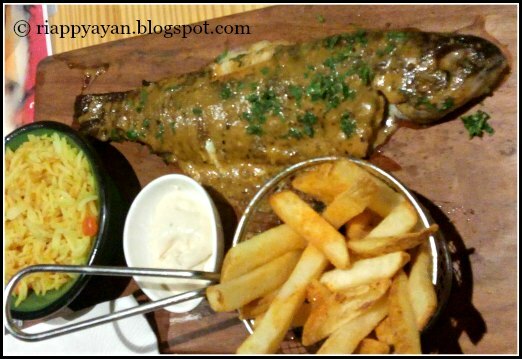 For the main course, we were served Grilled Trout Fish (another signature Portugese dish) with yoghurt dip and french fries. They suggested to try the fish with a mildly spiced yellow rice. The fish was fresh but found a bit under-cooked and I didn't like the preparation at all even with the rice which was also very mild to my taste. I love grilled fish but this preperation was nothing like it, I'm really sorry to say that there was nothing to taste other than their peri peri sauce. To rescue our taste bud, came their Peri Peri Chicken, their most signature dish, the flame grilled chicken with Peri peri sauce off coarse was just the opposite in taste. The chicken was quite juicy and moist and perfectly grilled. I drizzled their Tangy lemon sauce(served at the table) on grilled chicken and it remarkably changed the taste and I enjoyed every bite of it. 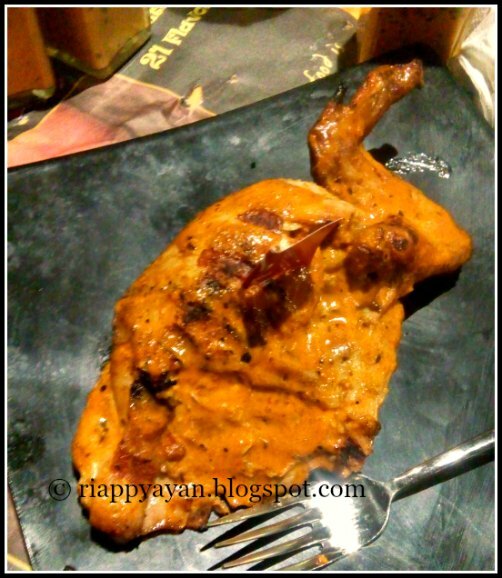 Its highly recommended for the first time go-ers who love chicken. As this joint is famous for its grilled chicken, the signature dish of 1/4 chicken, 1/2 chicken, full chicken, chicken steak are a must try. These can be selected with one or two side dishes which include spicy rice, mashed potatoes, green salad etc. Mine one and only recommendation to Barcelos is to add some Portuguese desserts in the menu, because first of all Kolkatans are famous for their sweet tooth and second of all, as much I know Portuguese have sweet tooth too and are very famous for their Egg Custard and Arroz Doce or rice pudding and for some pastry shops.